Iluvatar (the Supreme Being) made many attempts to illuminate the world, but these were opposed by Melkor (who was the forebearer of Sauron). The first light was made by two massive lamps on either end of the world, but these were cast down and destroyed by Melkor. The light of the Two Trees was captured in three brilliant jewels called "Silmarils" which afterwards became the source of much fighting and discord. These were eventually poisoned and destroyed by Melkor with the help of a massive spider (and ancestor of Shelob) but they have always captured my imagination. I've added a free 1024 x 1024 version on Reddit. Just as I pictured them! I hadn't logged into the site in a while, so I was clicking through everything since late last year and when I got to this one, before I even saw the title, my jaw dropped and I said to myself "holy @#$! that's Valinor!" While I never pictured the trees quite so bright, it's otherwise very close to how I've always pictured it. Excellent job. Stunning Tolkien would have loved it. Every time I return to my desktop I am -startled- by how beautiful this piece is. I would say "stunning" but that somehow seems to imply a one-time experience; this happens over and again. Amazing work. I still really like the Image. Not sure if it came off that way lol When I read the Silmarillion I pictured them as gigantic Oak Trees. 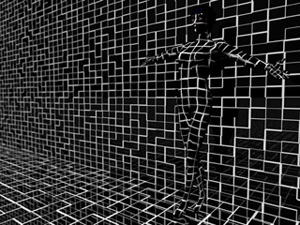 I searched for some images, just to see what was out there. I was surprised to see most were tall thin trees. Which makes sense when you consider they also created thin graceful elves, but still ;). The 4th version in the gentle hour looks by far the best. It's not as bright you you can see a lot more of the inner structure of the trees. They also seem to be fluid like. I'm not sure how it would look, but did you do a rough image of one tree bright and the other dark? Just curious. Thank you so much. That may be the best compliment I have ever received. You may have taken "quite a few liberties", but when I saw this image, on a screen without the title present, I gasped, "Tolkien." Thanks so much for the kind words! I spoke to Paul about your problem with the Android app. He suggested deleting the App Data and reloading. That worked for me and the new image showed up right away. Been a member for years and never felt compelled to give a 10 for a wallpaper before. Many 9's but this is my first 10. Besides the artistic quality of this piece, I totally dig the Tolkien influence. One complaint however, this is the ONLY wallpaper I can't seem to find on the DB Android app. I know it's developed by someone else but maybe you have some info why it's missing? Anyhow, you're still gracing my many shop computers with wonderful artwork every week. Keep it up, Ryan! Thanks!! You should be able to do that with the triple-screen once it is up. v.4 has got it. Really great piece. As for the multi-screen ... cutting off the top and bottom is a disappointment. Is there no way to use, say "2880 x 1800 (16:10) Lossless" and just add "sides" to it, as you've done in the past? Just a though. I use the duals at work, but I may have to stick with a single on this one. As always ... Bravo Ryan! This is awesome work! Amazing how you were able to take something so vivid in detail from a book and represent it. I am having some difficulty finding the right framing for the multiscreen. When I shorten the frame vertically (to widen it horizontally) a lot of stuff gets cut out. I don't want to crop the trees themselves too much but I don't want to leave out the environment either. I knew you'd make it work and you did. Very, very nice, thanks. I absolutely love the Simarillion. My Grandmother and I are huge Toklein fans, went to see The Hobbit over Christmas vacation. While I enjoy this render of the Trees of Valinor, I always pictured a softer but more expansive light from the trees. Not so much darkness around them but more of a fading of light as you distanced yourself from them. I always pictured the city of the first elves to be in an expansive valley, where the lights of the trees reached the slopes of the mountain with the intensity of a moonlit night. That being said, I still really enjoy this work! More Tolkein PLEASE!!!! Here is the Valinor3 zip. Enjoy! does someone have the zip file of Valnor3??? somehow I missed it!!! beautiful!!! You are definitely getting close with this! I am liking it more with each render. I think that the towers on the left side give some good perspective. As an aside, I am thinking that a more top view of this scene would be awesome and really show the grandeur of Valinor. I never read the Silmarrilion but enjoyed The Lord of the Rings. I think you've captured the essence of the beauty, power, and mystery of that world. A few minor changes for this fourth (and probably final) revision. I've made Laurelin leaves a little more red and a bit darker so the branches on both trees can be made out. The light cast by Laurelin is redder and a bit brighter. I've also tweaked the surrounding buildings a bit. @Chris B: I see your point but I always pictured the Valar as being more graceful and delicate. It was one of the Valar (Yavanna IIRC) who created the trees after all. Hope the multiscreen can have the trees further apart near the 2 ends of the screen. It really does keep getting better! v.3 is the best yet. I think this one does a much better job of capturing the "gentle hour". 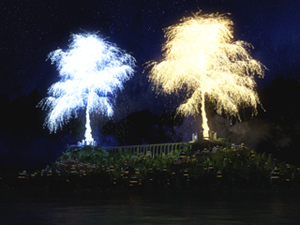 I look at the trees (it is improved in the 3rd version) and think oh cool, silver and gold glowing trees. Then you think, what are those lights under it? Then the scale starts to come into focus but it doesn't jump out at you. When You see the world tree or the Home tree, you are immediately thinking, "Woah that's one massive *add expletive here* Tree!" The trees are much better; we can now see the branches, which gives the trees more texture and dimension. Also, the reflection off the water is much improved, and so is the background. Unlike some folks, I've always liked the bridge and the stone pillars surrounding the base of the trees. IMHO, this is a go, Ryan. A winner, as always! Of course right after I posted the update yesterday I saw some things I wanted to change. This new version changes the camera angle a bit, updates the tree colors and the reflections. Getting closer to happy with this one. I hope you enjoy it! 99.999999% of your art I love and just has me going "Wow I wish I could even get as half as good as that" for the past ten years and more. This one just makes me go "Meh" for the very first time. It looks like two Christmas Trees dressed up and plonked in a hedge somewhere, very underwhelming. Great wallpaper but is there no Facebook timeline version? You can always do mythology like this in my book! Looks great! I definitely agree that this version gives a better sense of the scale/age of the trees. Their scale does make it difficult to get a proper perspective on the rest of the scene, but I think you've done a bit better job of that in v.2 as well. I like the bigger heads on the trees!--represents their age better. Maybe the final edit (if there is one) should make the trunk thicker? Looking good though! I've added an updated version this morning with much larger trees. There are still a few aspects I would like to tweak but changing the trees was relatively straightforward. I love the concept! However, at first glance (especially in a thumbnail or on my screen at distance) the stonehenge-like walls surrounding the trunks appear to be far too urban, like a bomb shelter, or beachside bunker like Normandy in WWII. This initial impression is reinforced when the full size is inspected as the bridge between the two has the same initial appearance. As far as the primary subject is concerned, I am not a fan of the trees' taller aspect ratio and agree with Tom's comment that a wider format on the trees would appear much more stately. They look just like Gingko trees planted in city sidewalks! Maybe I'm just a biased Southerner, but we love our wide, graceful live oak trees! Moreover, the rural/primeval feel I get from the Hobbit series is lost with the decidedly urban shape of the trees. Pleaes keep the series coming, as I love the idea of a dusk to dawn picture! Love the wallpaper, with the exception the golden dew drops laying flat take away from the image what it otherwise gives. Only within that respect it seems artificial, also the bridge that connects the two. Perhaps if I had read the book I may understand the image more and come to appreciate it. Still, a very enjoyable work of art. I think this is a fine image. Unless it was described in great detail in the book, what Ryan has submitted here is better for civil engineering than what the rules of Bonsai dictate. The trunk is thin, which allows more space for building under the branches. The apex is high, so the shadows need not be so long. I want to start out by saying thanks for all of your excellent work, appreciation and help with the promotion of my product! I can't wait for you to finish these so that I can try this out myself. :) Given that I am a Tolkien fan as well, this is very much a nice treat. I still have yet to read the Silmarillon - but after this, I will definitely be looking into it. 20/10 in my book. Thanks, as always Ryan. Ryan, I love that you've done this, and this is a great attempt. Like many of the commenters, I am a huge Tolkien fan, and it so happens I am currently re-reading the Silmarillon (with the audio book and Martin Shaw's amazing reading of it). I do have to agree with many of the comments here, though. I always imagined the Two Trees as very grand. I'm thinking of Ted Nasmith's painting of the Two Lamps in the illustrated edition of The Silmarillon; the scale of the majesty of the lamps is very apparent. I wish he had done a similar painting of the Two Trees for that book. Nevertheless, this wallpaper is great--thanks so much! And yes, I too would love to see more fantasy and sci-fi this year! I saw the Two Trees as being more "substantial" - like large, noble trees with big trunks - rather than slender, willowy trees. I love the concept, and look forward to further developments! I always tried to imagine what the trees would look like when I read the Silmarillion, I do think you have done a beautiful capture, can't wait to see the rest. I love the inspiration--the "creation" story in the Silmarillion always fascinated me. The trunks look a little spindly... I would like to see more of the architecture of the buldings below. Will that show up better during "noon"? 1 - the trees branching out more... they don't seem quite as majestic as I would've pictured, though I love the rain-like effect you have underneath them. Willow tree idea might work, although it's not a major point of contention. 2 - If they are shining over the entirety of the world, the ground should have far more variation in it - mountains, lakes, Mount Doom's volcano... it's a big planet. 3 - the cities are far too large for their structures in comparison to these trees - the whole perspective would seem more to me like looking down on the continents from a higher vantage point, as these trees are so big to illuminate the entire planet. 4 - the first peoples to populate Middle-Earth were Elves, Man, & Dwarves, after the Valar. If the races we know in Tolkien's books were descendants of them, I can't picture their original buildings looking as in your picture. Too... "alien" for this world, as another of your subscribers commented. One city looking more like Lothlorien, one pouring from a mountain cave, another similar to Gondor... that would show the variety that shines from the books. 5 - minor point - bridge between the trees is very odd to me, detracts from the trees & the cities you've created. Good idea but the execution isn't there yet. I have to agree with Celmendo below, they don't really look like grand majestic trees. I think I expect something fuller like a giant willow tree all lit up, maybe like this picture. Not a huge fan of the surrounding landscape and the heavy green color either. I feel like the surrounding area should look more blue and white like it is truly lit from the trees. Not trying to be overly critical cause there is a lot of potential. I see that a FB timeline render is absent for this image. That being said, I haven't read the Silmarillion yet, but it's on my "to read" list. I like this image for its mystical properties. There's something ethereal, yet incredibly powerful about it. It looks like the trees are "raining" light, however. Was this an intended effect, or were you looking more for a coronal one? Either way, it's a solid image, and you could have a lot of fun tweaking it! "11/10 - I love Valinor!" Ryan, this wallpaper almost brought a grown man to tears. My love for Middle Earth is immense, and I am an avid fan of Lord of the Rings and the Silmarillion (though to a lesser extent, The Hobbit). I instantly recognized the trees before reading your explanation. You have my full marks on this one. Well done sir, well done! I love Middle Earth! Gotta get back there someday. 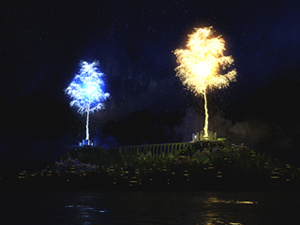 "Nothing but love for the concept..."
But it more resembles some weird fireworks and than some grand, awe inspiring trees with an inner glow. I know you'll make it work. It's still lovely. That would be awesome! maybe as the trees wax brighter the surroundings will provide more scale and grandeur. Great way to start a new year. Personally, I hope to see more Sci-fi and fantasy this year. One minor point, the mountains in the background dip around the trunk of the silver tree, which makes it look like there is a net or something behind it. I had to look to make certain that was just the mountians. Maybe they could be illuminated a little more to make them easier to see? Just an observation. I do like the work. Overall: 80%. 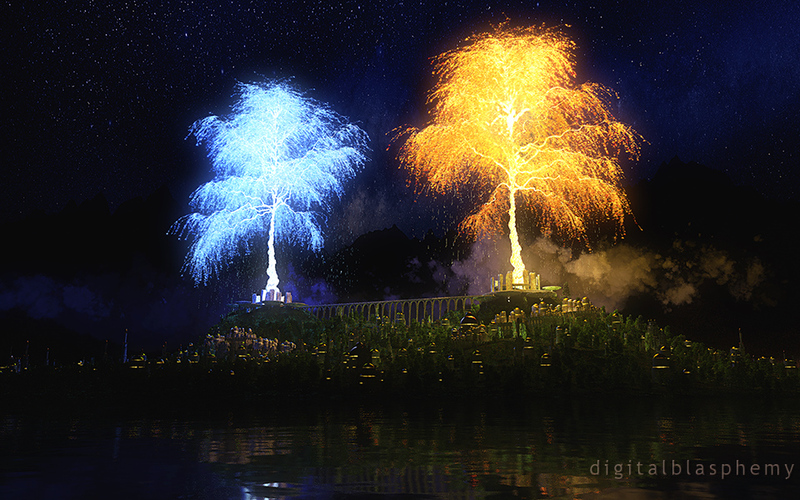 I think it looks like one of your older renders, but those trees are truly amazing. This is really great, I am a huge Tolkien fan and love the histories of Middle Earth and Arda. This image is very cool and I really like it, but when I look at it I don't get the perspective of grandeur and scale that i imagined in the Silmarillion. It may be that the surrounding of the trees is too dark to easily see their scale, or maybe the angle of the shotcoming from too low a POV, also maybe the zoom is too close to get a sense of the size of valinor itself in proportion to the trees. I am not sure, but I LOVE the subject of this image and would love to see some tweaks to scale.